I feel like I’ve been quite a bit MIA from my blog the past few weeks. Between part-time accounting work, crazy kiddo schedules and trying to design some knitting patterns (more on that later), I haven’t been able to sit down long enough to actually post something here in a while. I’m having a lot of fun trying to design some socks. I carry a graph paper notebook with me everywhere. I’m almost at the point where I can write the pattern down and put something on Ravelry so stay tuned for an update. I’m also knitting some socks for my husband. I’ve knitted socks for my daughter (who says thank you and wears them), my son (who says thank you) and for me (I love my hand-knitted socks). But I haven’t tackled anything for my husband until now. 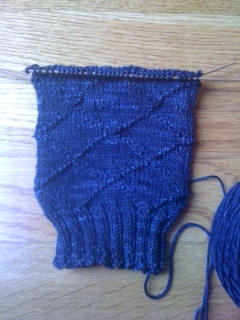 Of course, he wanted dark socks which I am finding are very difficult to knit in the evening. I’m using yarn from The Sanguine Gryphon in Sooty Dancer (Bugga) which is knitting up quite nicely in this diamond pattern. I wanted to knit something a little bit more interesting than a plain sock and this pattern isn’t difficult and provides a nice, simple detail. Hopefully, perfect for my hubby! I’m thinking of trying to knit a shawl or wrap soon but can’t decide on a pattern…any suggestions? My daughter’s dance recitals and two, yes two, weeks of rehearsals are coming up (next week start’s the rehearsals) so I am feeling a bit of a need to start a new project to get me through those looonnnnnggggg nights of rehearsals. So…whatcha been up to? Tell us here!